An artist's reconstruction of Ledumahadi mafube, which means "a giant thunderclap at dawn," foraging during the early Jurassic in South Africa. 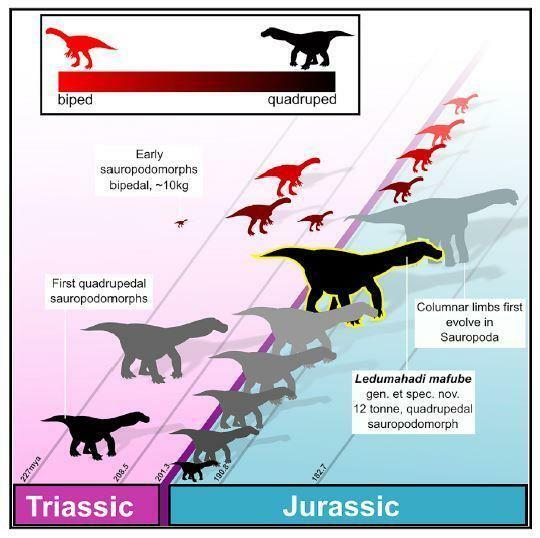 This graphical abstract shows how four-legged postures with flexed limbs potentially evolved several times in this group of related dinosaurs. They've dubbed the newly discovered dinosaur Ledumahadi mafube, which translates in the Sesotho language to "a giant thunderclap at dawn." And the discovery sheds light on how giants like the brontosaurus got so huge. The discovery didn't happen quickly — it took years to get this dinosaur out of the ground. "It's quite a long, sort of drawn-out story. It starts, I think, around 1990," says Universidade de São Paulo paleontologist Blair McPhee, one of the researchers who discovered the dinosaur. McPhee says a few huge bones were discovered near South Africa's border with Lesotho during a construction project. They were brought to the University of the Witwatersrand, where they sat for more than a decade. Years later, a scientist stumbled upon more bones sticking out of rock in the same area. A team spent four or five years painstakingly excavating them. "It took a long time because the sediment they were encased in had basically turned to concrete over about 200 million years, and it was sort of on a slight cliff face," McPhee says. Tests showed these bones matched the ones discovered in the '90s. And what was immediately clear was that this creature was enormous. It would have weighed in at around 12 tons. As McPhee put it, they think it had "about twice the volume of an African elephant." Around the time the creature roamed, dinosaurs were thought to be smaller. "I was really surprised that they found a dinosaur this big, this old," says Adelphi University assistant biology professor Michael D'Emic, who specializes in the evolution of dinosaur growth and was not involved in the research. And there was something else that was surprising. The researchers think this dinosaur evolved from a smaller ancestor that walked on two legs. And it's likely an early cousin of even larger animals like the brontosaurus, a type of herbivore called a sauropod that lumbered around on four legs. McPhee says this is a transitional dinosaur. As the researchers were excavating the bones, they noticed the dinosaur's front legs were strikingly different from those of its later relatives. In fact, its front legs legs look more like those of older, smaller dinosaurs, which used those limbs to grab things. Those animals "had a grasping hand and they even sort of had like a rudimentary opposable thumb," McPhee says. And its back legs are like huge columns, similar to those of an elephant or a brontosaurus. 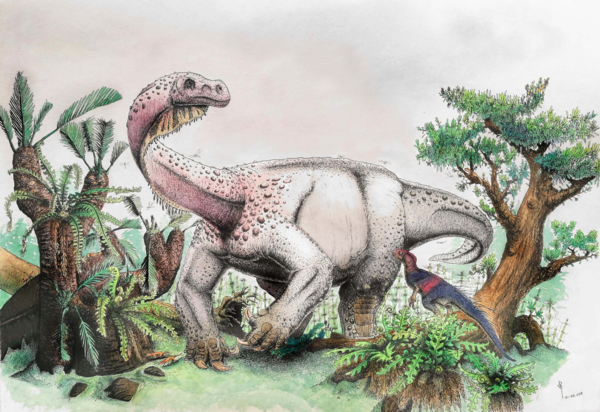 The scientists think that this dinosaur could have reared up on two legs to, say, nibble on high branches but that it mostly walked on all four legs. That adaptation kept the huge dinosaur more stable — and is what may have helped its later relatives to grow even larger. And it still had those grabby forelimbs. McPhee says he sees L. mafube as "the animal that wanted to have it all, that wanted to have everything." To figure out whether the animal walked on two or four legs, the team compiled a database with the measurements and proportions of living animals, and used it to infer how L. mafube likely walked. "Generally, if something had limb proportions of this particular type, it correctly predicted what kind of locomotor it would be," McPhee says. He says, "The idea that it would be predominately bipedal seems unlikely just because of its sheer size." The researchers published their findings Thursday in the journal Current Biology. This is a robust time to be a paleontologist. D'Emic says there have been several dozen dinosaurs already discovered this year — and new discoveries can potentially change the common wisdom of how dinosaurs are related to one another. "There's a lot of reshuffling of our understanding and refining of our understanding," D'Emic says. "This is not the end-all-be-all of how this animal is related to other animals, and I'm sure it's going to spur a lot more research, too." Scientists have discovered a new species of dinosaur that once roamed South Africa. NPR's Merrit Kennedy reports that the find sheds light on how giants like the Brontosaurus got so giant. MERRIT KENNEDY, BYLINE: It took ages to get this dinosaur out of the ground. BLAIR MCPHEE: So it's quite a long (laughter) quite a sort of drawn out story. It starts, I think, around 1990. KENNEDY: Paleontologist Blair McPhee says a few huge bones were discovered during construction near South Africa's border with Lesotho. They were brought to a university where they sat for more than a decade. Years later, a scientist stumbled across more bones sticking out of rock in the same area. Researchers then spent four or five years painstakingly excavating them. MCPHEE: I took a long time because the sediment they were encased in had basically turned to concrete over about 200 million years, and it was sort of on a slight cliff face. KENNEDY: Tests showed these bones matched the ones discovered in the '90s, and what was immediately clear was that this creature was big. It would have weighed in at around 12 tons. MCPHEE: Which is about twice the volume of an African elephant. KENNEDY: And McPhee says that there was something different about this dinosaur. Around the time this creature walked the Earth, during the Early Jurassic, dinosaurs were thought to be smaller. Adelphi University biology professor Michael D'Emic specializes in the evolution of dinosaur growth. MICHAEL D'EMIC: I was really surprised that they found a dinosaur this big this old. KENNEDY: At the time, it would have been the largest known land animal to have ever existed. The researchers think the creature evolved from a smaller ancestor that walked on two legs. And it's likely an early cousin of even larger animals, like the Brontosaurus, that lumbered around on four legs. McPhee says this is a transitional dinosaur. Its front legs look a lot like those of older, smaller dinosaurs, which use those limbs to grab things. MCPHEE: They had a grasping hand, and they even sort of had, like, a rudimentary opposable thumb. MCPHEE: The animal that wanted to have it all, that wanted to have everything. KENNEDY: The scientists have named it Ledumahadi mafube, which means a giant thunderclap at dawn. Merrit Kennedy, NPR News. Transcript provided by NPR, Copyright NPR.